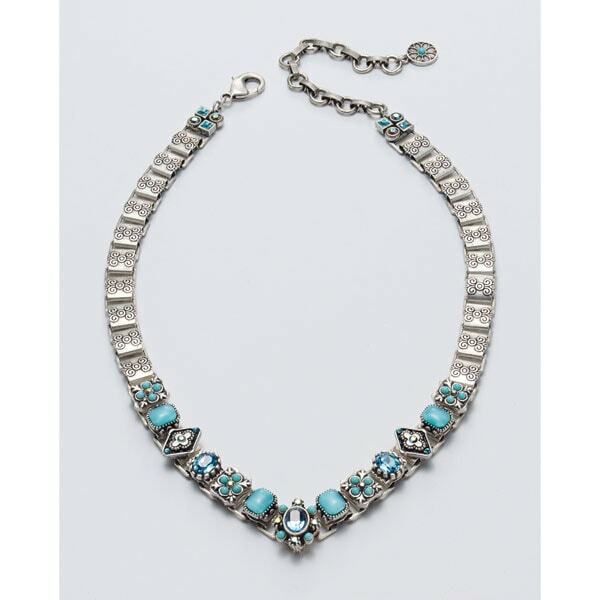 Styled after a carcanet, a Renaissanceera collar piece revived by the Victorians, the extravagant necklace is set with turquoise-colored cabochons and faceted blue crystals. The chain is made from dies dating from the late 1800s. 19 ½" long, ½" wide. Bracelet with fold-over clasp is 7½" long. Set of 3 pairs of post earrings are about 3/8". All sold separately. Designed by award-winning jewelry artist Shelley Cooper, made in Los Angeles.